The Converse Blog: The Converse Blog's Weapon Wednesday, Weapons of Mass Destruction! The Converse Blog's Weapon Wednesday, Weapons of Mass Destruction! "Welcome all and welcome all its that beat that hurts em all it's that classic instant smash hit it's that heat that burns em all." Those are some words of wisdom from my man RedCloud, don't sleep. It's Wednesday day, Team USA and D Wade are rolling, Nibroc starts today, and I am flying high off of the paint fumes coming from the living room...okay not really flying high, but you knew that. Keeping up with apparent tradition of not showing any shoes this week, today's Weapon Wednesday takes an interesting and exciting turn. Late last night I found a new t-shirt up at Converse.com. It's titled Mass Destruction Tee. It sure is, take a look at it here below. 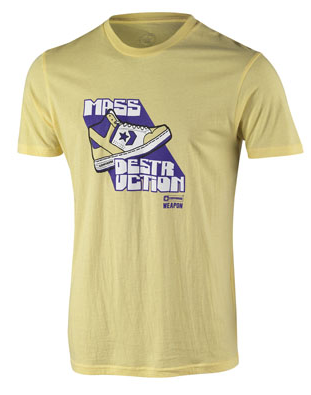 The Lakers Weapon colorway is center stage in this shirt wedged between "Mass" and "Destruction." 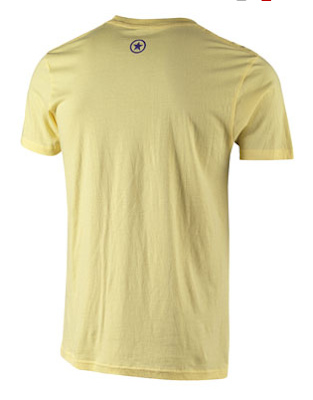 However, for a Converse freak like me the best part of the shirt is the little logo on the bottom. It is the original Weapon logo with the 1986 era Converse logo. Yes, I am talking about the Square and Star Converse logo...it is simply beautiful. Plus, for all those fans of the Lakers colorway Weapons, but didn't really like the Lakers, now you can have a shirt to wear. Thanks for checking out the blog, don't forget to vote today, it is the last day of the current poll.